We have bearproof garbage cans for sale and in stock. Nordegg is considered primary grizzly bear habitat and both grizzly and black bears live in the area and occasionally pass through the North Nordegg Subdivision. Managing food attractants is the simplest way to avoid conflicts between people and bears. 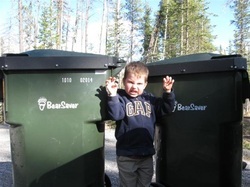 It is essential that all garbage is stored either inside or in a bearproof container. 65 gallon bins are $215, while 95 gallon bins are $228. We have both kinds in stock and can deliver them to your lot in Nordegg. Contact us. Sign up for the weekly bear report... It's free!